I remember that old thread now. Such a uniquely different watch now, all the better for it. Far better than PVD Black. Alas. Not my cup of rosey. Will you IPB be heading the same way? That looks fabulous Alex, a really great and quite inventive solution to a less than perfect PVD watch. Out of interest, if you’re willing to share the info, may I ask how much they charged for the work? If you don’t want to make it public, perhaps a PM if you’re willing to do so? I don’t mind it being public, but I don’t want Jay at MCWW to be tied to a price! When I enquired about a year ago, the price was agreed at 185USD. That remained the price for the work. I thought that was entirely reasonable as it included return postage to the UK. Thanks Alex. Not so much a watch case for me as a bracelet... thinking of getting one bead blasted, but having a hard time finding a local company to do it. gaf1958 wrote: Thanks Alex. Not so much a watch case for me as a bracelet... thinking of getting one bead blasted, but having a hard time finding a local company to do it. Presumably for a Kingfisher or two, Gary. Thanks for posting. I think my Trident GMT might be making a trip to Detroit for the hi-light finish. It's always been just a little bit too dressy for my taste so this looks like the perfect answer. Bahnstormer_vRS wrote: Presumably for a Kingfisher or two, Gary. Looks great - the one thing that put me off the Tri-techs was PVD coming off when using it as I didn't want to treat it mega softly forever due to that! I think it'd be nicer still if the raised number bits were black (with numbers still bead blasted) to provide a bit of contrast, but it is still really nice as is. What strap is it on? Always looking for other good candidates for my Kingfisher! It’s a CWL soft touch leather strap. They appeared as a special at sale time. 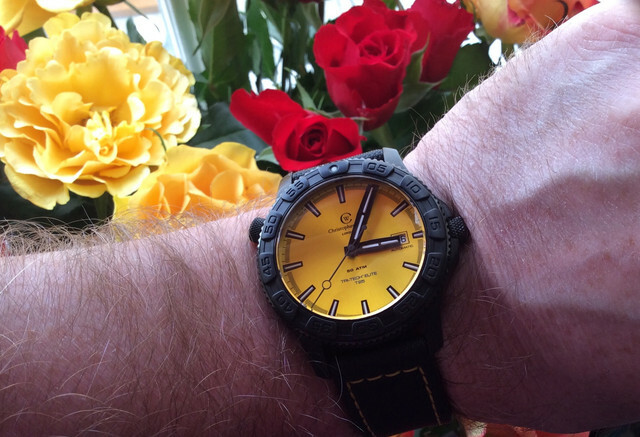 I assume something similar will appear on the CWL soon as the black dial 316 Trident will come with a yellow and black strap. It would look good on a Kingfisher. I’d forgotten that he had a newer style bracelet blasted to match the case. If I do send my IPB C600 in, I’ll be tempted to do the same. Thanks for the answer; I'll have to look out for that when it's out. That looks sharp Clach. I think if it was my watch the one change I would make would be to paint the bezel numbers black for a little contrast. That's the great thing about modding though: You can do exactly what works for you.